Right behind the Podere’s kitchen you will find the wood oven. 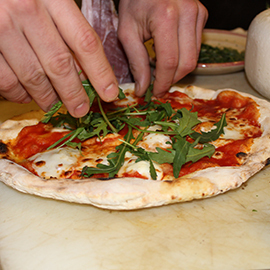 Here, aspiring pizza chefs will be shown how to prepare a perfect, tasty pizza. The lesson starts from the choice and detailed explanation of all the ingredients to end with the final result. The present activity is highly recommended to anyone who is on vacation with children and is willing to treat them with moments of pure enjoyment. The course lasts around 3 hours and is available in Italian, English, German and French.